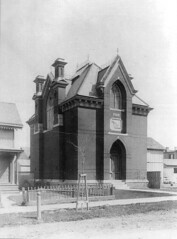 This is a historical photo of The Shant, the meeting house of Delta Kappa Epsilon on William St. One of the projects for the preservation course will be to do a measured drawings project for the building (potentially for entry into a HABS student competition). This was designed by William LeBaron Jenney, one of the pioneers of the skyscraper. It was one of two he did while teaching architecture courses in Ann Arbor. The other was a University museum, since demolished. Register now while there's still space. So few windows! Is that typical of old fraternity houses? Not from what I know. This was initially a meeting house and I don't think it was ever a residential building. No windows at all, according to an alum of that fraternity; he is an architect, too. It's an odd little building, and (sadly) poorly maintained at least from the outside. Well, it looks fascinating. Some ancient Greek cults were all about cave-like interiors, too. I'm looking forward to finding out more about it. Cool. As the flickr link indicates, I was there today and took some photos inside. No windows on the walls except the 3 stained class numbers on the south, east, and west walls of the upper floor. There is a skylight (I think visible on and around the ridge of the roof in the historic photo) that lights the upper floor. Can't wait to get to work on this.